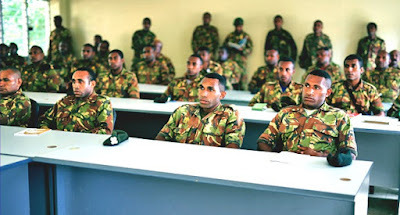 A total of seven hundred soldiers are receiving training on international humanitarian law to prepare them for peacekeeping missions abroad. Battalion second-in-command Major Posoi Benjamin told The National that the training at Taurama Barracks would ensure the soldiers were prepared to take up peacekeeping duties. “Most of us think we can do anything when we are in our uniform. So this training will also change the mindset of the soldiers and enhance their knowledge on how to approach civilians,” Benjamin said. He said the International Committee of the Red Cross (ICRC) was conducting the training. ICRC communication cooperation delegate Dan Waites said there was a possibility that some of the soldiers would be deployed in peacekeeping missions in the future so they needed to have a good understanding of international humanitarian law. ICRC head of mission Mark Kessler said they were happy to assist the PNGDF with the training. “It’s a positive sign of their commitment to professionalism that they invite us to conduct this briefing each year,” he said. Kessler said the training covered topics such as persons protected in conflicts, the role of ICRC and principles applying to lawful conduct of hostilities. Taurama Barracks commanding officer Lt-Col Edison Napyo said the briefing was important for the soldiers to learn more about international humanitarian law.